Material Issue was one of us. They were three men who looked barely old enough to drive, let alone take their van and self-recorded albums across the country. They didn’t have managers or producers in the beginning, doing everything themselves. This was grass-roots music, and the music, too was ours. Material Issue had grown up with us. They weren’t ashamed of their Cheap Trick records. Rather, they legitimized that same 80s guitar sound into unforgettable riffs that decorated three-chord 90s songs. They were one of us, forming in college like so many failed bands. It was at Columbia Arts College of Chicago that singer/songwriter/guitarist Jim Ellison met bassist Ted Ansani. The two realized they had influences in common and began to play together. Ellison’s professor, Blake Levinson, still remembers this time: “When Jim had told me he was in a band, I didn’t think much about it because it wasn’t unusual for college kids to be in bands. I started to pay a little more attention when he said he was having problems re-negotiating a recording contract. And then, near the end of the semester, he invited me to attend one of his shows at a club on Belmont. Though I had attended similarly crowded and loud venues with other bands through the years, this one was very different for one reason–Material Issue was great, ‘professional big time’ great.” By the time of that concert, Material Issue had, of course, found a drummer in Mike Zelenko. He was chosen after responding to an ad in the newspaper, and, while he claims they only chose him because he owned a van, he became an inextricable part of the band’s sound. The ordinariness of their lives, coupled with the genius of their music and live performances, made Material Issue gather a following quickly. Even before they were signed to a record label, they had fans comparing them to early U2, bragging to Chicago Tribune reporters about having seen over 100 shows, and circulating fan newsletters. Zelenko remembers a trio of three friends who followed them from show to show for several weeks one summer. Clearly, fans weren’t the only ones to think this was a band that got it. Zelenko remembers the determined energy of these times, saying that the band played their first show only one week after he joined. They were all in agreement that the best way to improve while building a name for themselves was to play as many shows as they could. Zelenko remembers that first show, performed at the Exit in Chicago, saying they were probably “pretty terrible” but remembering it going pretty well. There was one snag, though: only Ellison was of legal drinking age, so Ansani and Zelenko had to wait in the car until showtime and leave immediately after the show was finished. The “what happened” in Ansani’s words is a glaring euphemism. In 1996, the band had recorded their third album, “Telecommando Americano,” but had been dropped by Mercury Records and was currently unsigned, a situation that seemed to liberate Ellison rather than trouble him. Though some cite the career struggles and many cite a recent romantic disappointment, no one really knows what made Ellison take his own life on June 20, 1996. While the premature loss of other musical legends such as Kurt Cobain, Elliott Smith, and Ian Curtis was never really mitigated by each one’s troubled mental history, at least the friends, fans, and family of those men knew what demons existed for each. There were no indicators of Ellison’s mental state, even in the last few songs he wrote. Ellison, like any songwriter, had lyrics that could be decontextualized as warning signs. There is definitely a sadness to moments on “Telecommando Americano,” released after Jim’s death. “Carousel, I thought you knew me well, I guess you couldn’t tell I’d fallen down again,” is striking in hindsight, but Ellison’s friends and bandmates maintain such moments are more coincidental than prescient. 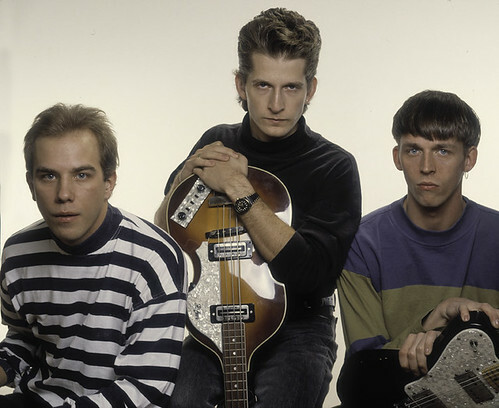 Material Issue was also a band’s band, leaving their mark on many musicians. The way the band mixed retro sounds with a more punk-inspired three-chord structure expanded possibilities for all musicians wanting to straddle genres and generations into music that was familiar but new. No wonder their presence has lingered as a muse for other artists. Their most obvious legacy is perhaps in contributing the name to the International Pop Overthrow Festival, organized by David Nash, who has fond memories of seeing Material Issue open for another Illinois band, Shoes. “I think it was in April of 90, or earlier, maybe earlier in the year. They played a club called Bogart’s at Long Beach. I didn’t know who they were. 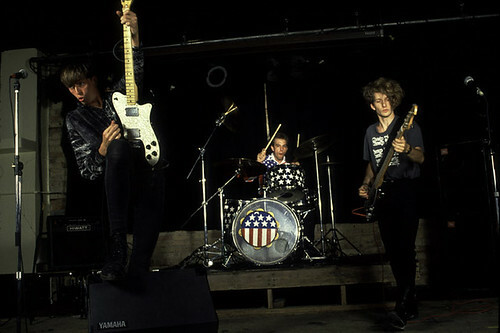 I remember them coming on stage, and seeing these three guys come on stage, and they had this punk attitude. But I did really feel like they had a lot of potential, maybe because of Jim and the charisma that he exuded onstage. When I first decided to name the festival International Pop Overthrow, it was in large part in tribute to Jim and to Material Issue, and I wasn’t sure how the members of the band would take it. I got an email from Mike and he was flattered by it,” Nash says, adding that Ansani and Zelenko have both played the festival with other bands. Ansani and Zelenko continue to be musically active in the Chicago area. In fact, they are currently playing together again, supporting singer/songwriter Darren Robbins. Musicians farther removed also continue to make music inspired by Material Issue. The Alkaline Trio’s Matt Skiba told Mike Meyer that Material Issue helped inspire the band’s latest release, “Agony and Irony.” The Tragically Hip wrote a song, “Escape Is At Hand For The Travellin’ Man” about Ellison. Clearly, like the rest of us, she was still more than a little bit smitten. Article by Erin Lyndal Martin, Some Photos by Paul Natkin. Special thanks to Ted Ansani, Blake Levinson, Liz Phair, Mike Meyer, Dave Nash and Mike Zelenko for their time. Great job on this Erin. Material Issue was one of my favorite bands of the 90’s. I remember seeing them at the Taste of Chicago with the Replacements. The fact that it was the last Replacements concert was helped by my introduction to Material Issue. I loved International Pop Overthrow, but I think Destination Universe was my favorite. There was a movie I caught on television a few years back that featured a lot of Material Issue songs. Does anyone remember what the name of the movie was? I believe it was "Poison IvY" being played on a car radio as the girl got in the car. Mrs. A. At some point in the mid-90s I made the leap from a hereditary preference for Brit Pop to the sounds of the big city next door, from Pulp to Liz Phair and then Material Issue. It makes me sad to think that I was less than 40 miles from greatness and yet never saw “Next Big Thing” played live . . .
Material Issue was an awesome band. Being from Chicago, they were one of my favorites. I wasn’t aware before that Ellison died before Telecamdno Americano was finished. That’s very sad. I loved the Tra La La video! I had never seen that before. Liz Phair rules!!! Material Issue was an inspirational band. It is tragic that their musical career was cut short when front-man Jim Ellison committed suicide…. A look back at the late great Jim Ellison, and the Chicago band Material Issue. Exclusive interviews with the members of Material Issue and the ever-awesome Liz Phair…. I learned about Material Issue when the cover of Everything came out a couple years ago. I ended up buying all their music and loved it. Do Mike and Ted play any Material Issue songs when they play together? Jim Ellison, and the Chicago band Material Issue remembered with exclusive interviews from the band members and Liz Phair…. thank you for the great article. i was a huge fan throughout their career together and of all the bands i've loved, i still have the most fondness for material issue. Jim I miss you think about you often and the times I drove you home from school on Thursday nights, I guess you were right all I needed to know were three chords. Wish you were still here. He killed himself with a moped, that must have taken 10 years.. that is determination! A nice summation of one of the most influential, inspiring bands of all time. Jim Ellison’s legacy will live forever through his hauntingly , often painfully honest songwriting. RIP Jim…thanks for giving them the credit from the “critics” that they have always received from their fans. I grew up in South East Los Angeles to the sounds of chicano blues, latin jazz, classic rock and underground rap. I recently discovered MI while at a bar one night and fell completely in love with “Valerie Loves Me” . I had to have more! Needless to say, that was just the very beginning of my love affair with MI. This music has changed my views and I’m forever greatful to the awesomeness of Jim Ellison.